I bet if you go to your kitchen cabinet right now and pick up the first food package you see, you’ll find the word “flavor” somewhere on the ingredient list. Am I right? Yep, the processed food industry adds flavors to almost EVERYTHING. When a food is heavily processed with machinery in a factory, pumped full of preservatives, and poured into a package that gets shipped across the country to get stored on a shelf for months it loses flavor. That’s why there is a multi billion dollar flavor industry dedicated to creating chemicals that make all that processed food taste like… well… real food. Not only do these flavors make fake food taste real, they also give it a special “kick” that keep you coming back for more. The natural and artificial chemicals that flavor manufacturers engineer are contributing to what David Kessler (former head of the FDA) calls a “food carnival” in your mouth. The inability to stop eating because the flavors they have synthesized trick your mind into wanting more and more. Why do Americans eat more calories than any other industrialized nation? It’s not because we have more money or are more hungry. It’s because our food supply is chemically produced and enhanced with these “flavors” and it’s EVERYWHERE and we are being TARGETED. You see, they don’t want you to have the full essence of the strawberry – they want you to only experience the best 1 millionth part of the taste – so you get “addicted” and keep having to go back for more and more, searching continuously for gratification – eating more of that product which in turns fills Big Food Companies pockets. The Big Food Companies are “hijacking” your taste buds one by one. The term “flavors” on a package highly misleading. It sounds innocent and is on SO MANY products that we are desensitized to it. Flavor companies own these proprietary formulas… making it near impossible to find out exactly what’s in them. You’d like to think that “natural apple flavor” is just some juice extracted from an apple and inserted into the food. Nope. That “natural apple flavor” needs to preserved and stabilized and has agents added to help it mix well into a product. 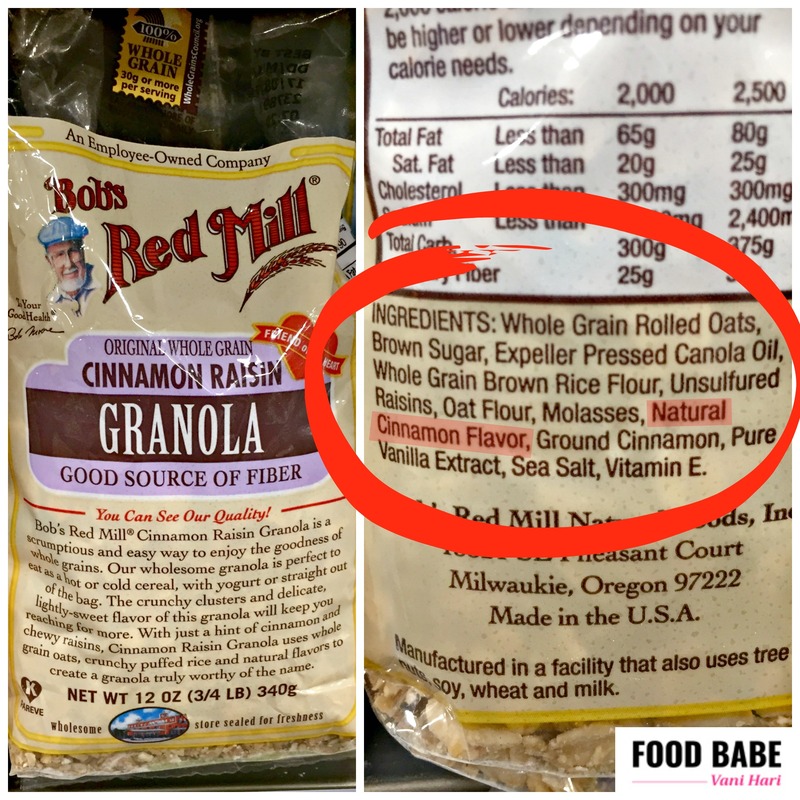 This is why flavors can contain upwards of 100 ingredients like propylene glycol, polysorbate 80, BHT, BHA… all considered “incidental additives” not required to be labeled by the FDA. 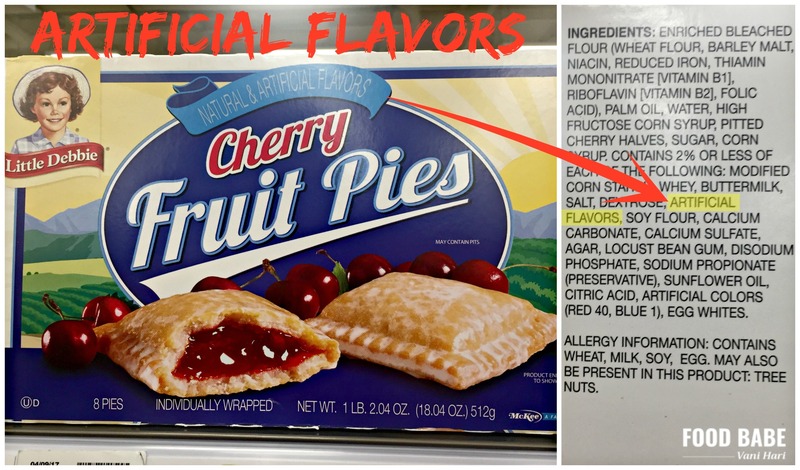 The FDA doesn’t require companies to tell you what is in the flavors they use. It’s a complete mystery ingredient. The fox is guarding the hen house. You see, a governmental or independent agency does not approve or oversee the safety of the food flavors. Instead, a flavor industry trade group, the Flavor and Extract Manufacturers Association (FEMA), has assembled their own “independent” panel of scientists who review and approve new flavors as Generally Recognized As Safe (GRAS). These scientists are paid by the FEMA trade group (who ultimately get their funding from flavor companies). And, of course, these FEMA panel scientists are supposed to be independent and free of conflicts of interest, but many questions have been raised about their closed-door evaluations and lack of transparency with the public. The fact that this panel is assembled and paid for by a flavor company trade group is concerning to say the least, don’t you think? Public advocacy groups have questioned FEMA’s processes and called on the FDA to ban certain flavor substances that have known links to cancer, but little has been done. Some chemicals used to make flavors, like Diacetyl (which is used to make buttery flavor), are highly dangerous for those that work around them… but we are supposed to eat them and be okay? Consumers want to know what’s in these flavors and what research has been done proving their safety, but we essentially get the door slammed in our faces when we ask. The laws surrounding these flavors are lax to say the least, and companies don’t have to tell you much about what they really are. 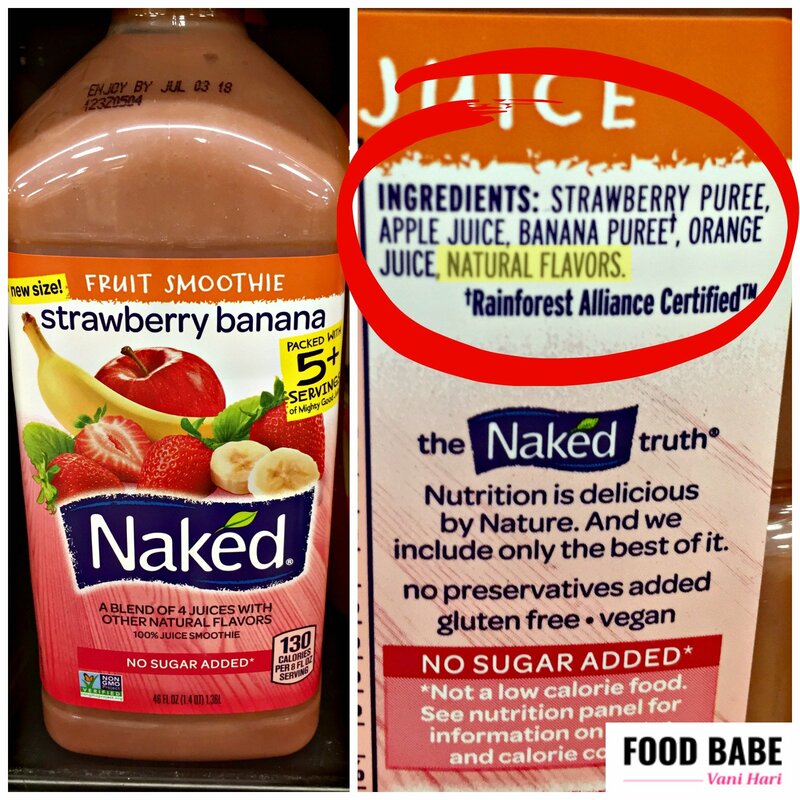 Labels on food typically just say “natural flavors” or “artificial flavors” and don’t explicitly tell you what differences are between them. It’s good to know that there are some stark differences between artificial flavors, natural flavors, natural strawberry flavors, organic raspberry flavors, natural essences, organic extracts, etc… And while these are all largely the same, some of the flavors added to food are better than others. So, if you’re like me and want understand exactly what you’re eating and to know more about what these labels all mean, I created this Flavor Cheat Sheet below to break it all down. Now let’s go over some real world product examples, let’s start with the worst flavors in our food… Artificial Flavors. 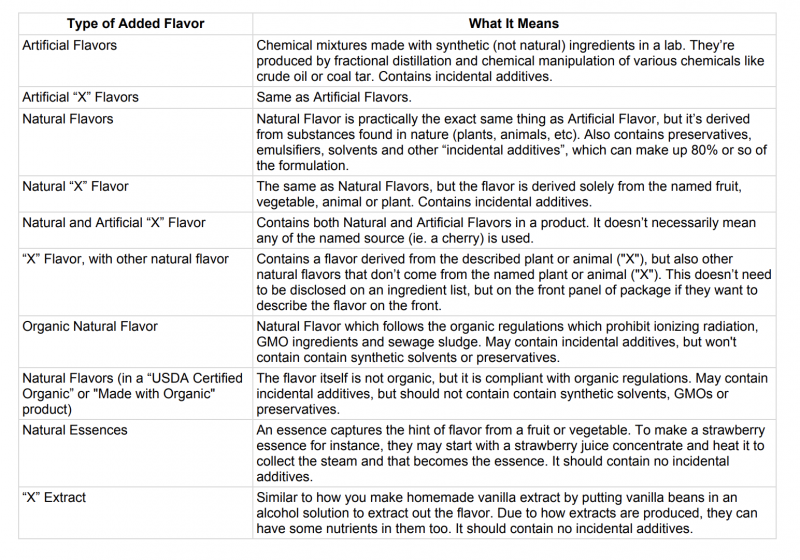 Artificial flavors are chemical mixtures made with synthetic (not natural) ingredients in a lab. They’re produced by fractional distillation and chemical manipulation of various chemicals like crude oil or coal tar. Artificial vanilla flavor can be made from wood pulp. 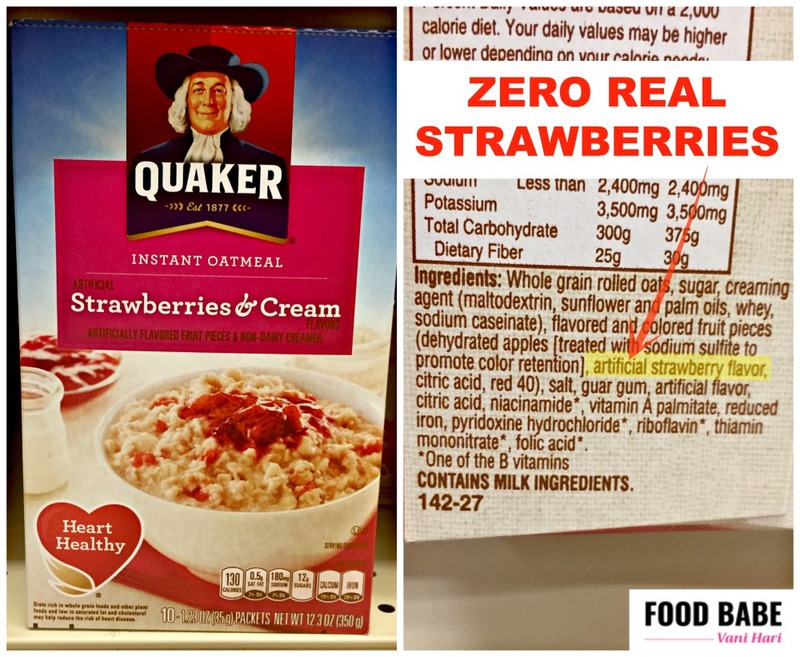 With artificial flavors, chemists can make anything taste like a strawberry without any actual strawberries (or any actual food for that matter), which is a really horrible thing if you care about health. But it’s a great thing for food manufacturers because artificial flavors are much cheaper than using real food (or even natural flavors). Natural Flavor is practically the exact same thing as Artificial Flavor, but it’s derived from substances found in nature (plants, animals, etc). So, the flavor is DERIVED from natural things, but it’s important to remember that this isn’t all it contains. Remember, flavors typically contain preservatives, emulsifiers, solvents and other “incidental additives”, which can make up 80% or so of the formulation. Some of the most common incidental additives in flavors include: sodium benzoate, glycerin, potassium sorbate, and propylene glycol (none of which are labeled). 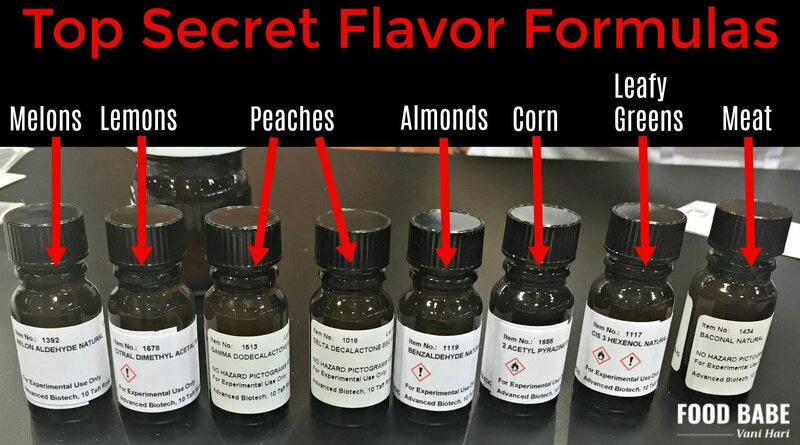 Chemists create these complex formulations in a lab, isolating and blending specific flavors extracted from upwards of hundreds of compounds, some of which may be GMOs. These compounds can come from substances that are nowhere close to the actual thing. For example, they might take some castoreum from a beaver to make a flavoring that resembles a raspberry – without ever using any raspberries. But, hey, it’s “natural” because it’s from a beaver. Image Credit: Science in the News, Harvard Graduate School of the Arts and Sciences. In general, if you see something like “Natural Cinnamon Flavor” this means that the flavor is derived solely from the named fruit, vegetable, animal or plant, which in this case is cinnamon. In other words, if you see “Natural Raspberry Flavor” on a product, the flavor didn’t come from a beaver, but actual raspberries. The reason food companies use this kind of flavoring is because it’s cheaper than using the actual ingredient in it’s raw form. The flavor also can be synthesized to be the best “one millionth” part of the taste of a substance – something definitely not found in nature. Incidental additives still apply, of course. 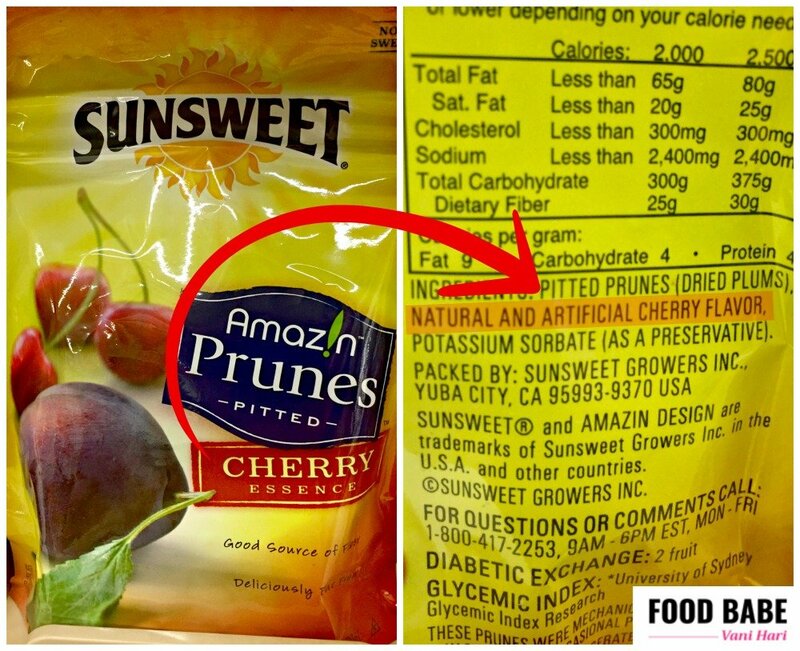 You’ll see a label like this when there are both natural and artificial flavors in a product. It doesn’t necessarily mean any of the named source (ie. a cherry) is used. Sometimes on the front of a package you’ll see the statement “Raspberry Flavor With Other Natural Flavor”…which sounds redundant. This means the food contains a flavor derived from raspberries, but ALSO other natural flavors that don’t come from raspberries. This doesn’t need to be disclosed on an ingredient list, but is required on the front panel of package if they want to describe the flavor on the front. A lot of people have told me they’re surprised that organic foods can contain natural flavors. 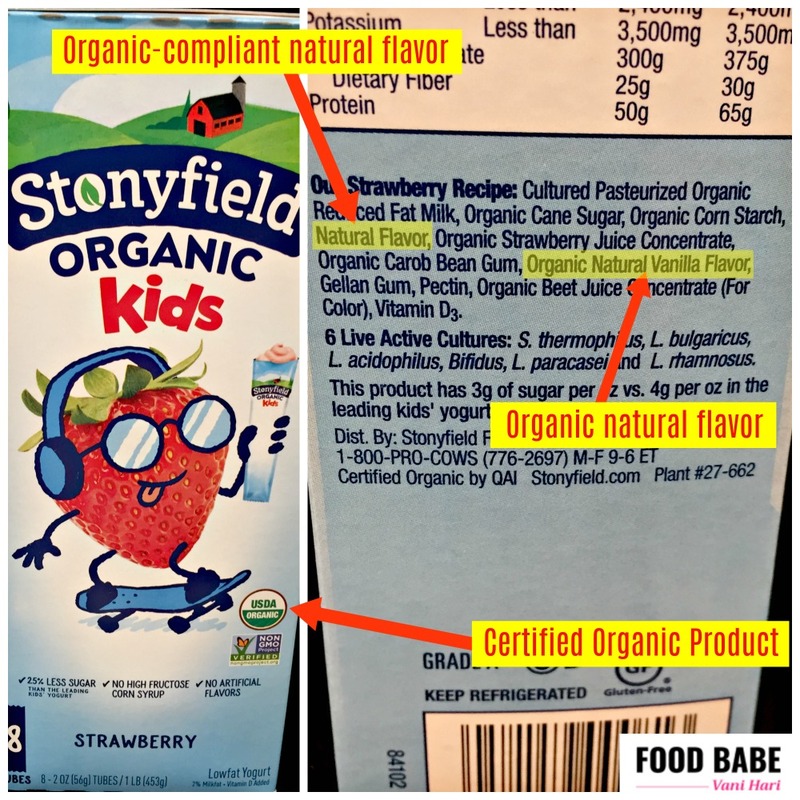 While it’s not ideal, at least “Organic Natural Flavor” is made just like other organic ingredients and needs to follow the same regulations. That means that organic flavors won’t contain synthetic solvents or preservatives, and no GMOs. 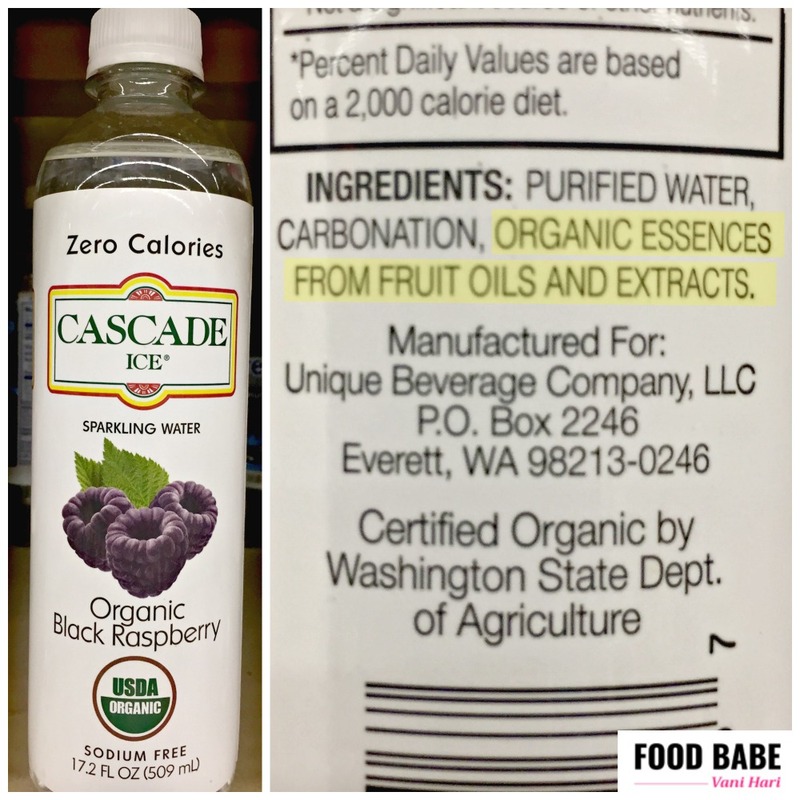 Some the the “incidental additives” banned from organic flavors include propylene glycol, mono and diglycerides, BHT, BHA, and polysorbate 80. 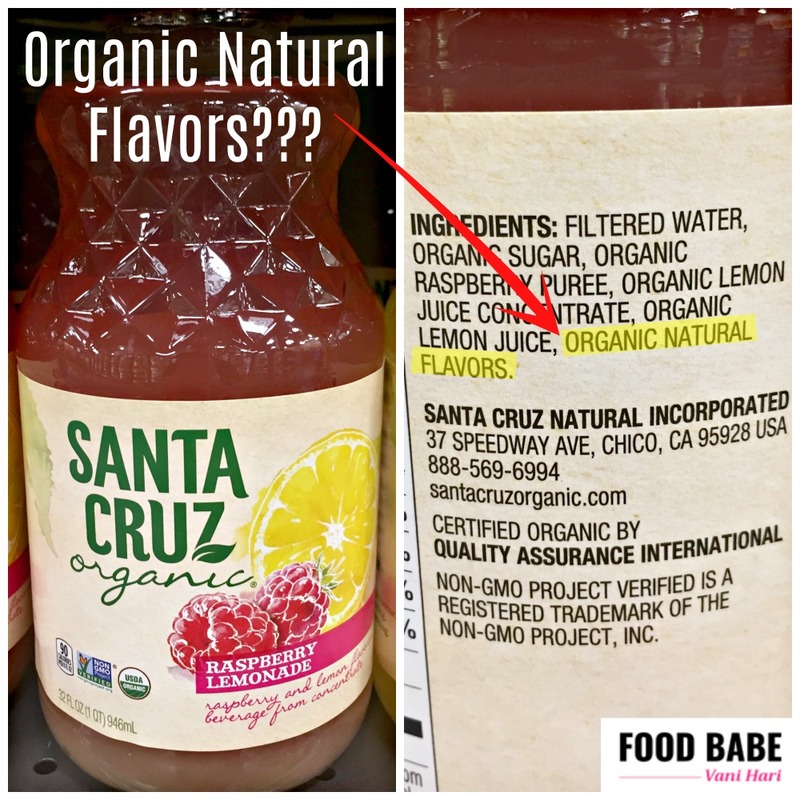 Sometimes you’ll just see “natural flavors” listed on a certified organic product (instead of “Organic Natural Flavors”). This means that the flavor itself is not organic, but it is compliant with organic regulations – such as no synthetic ingredients or GMOs. So, ultimately, these flavors will have a cleaner profile than the average natural flavor in a conventional product. 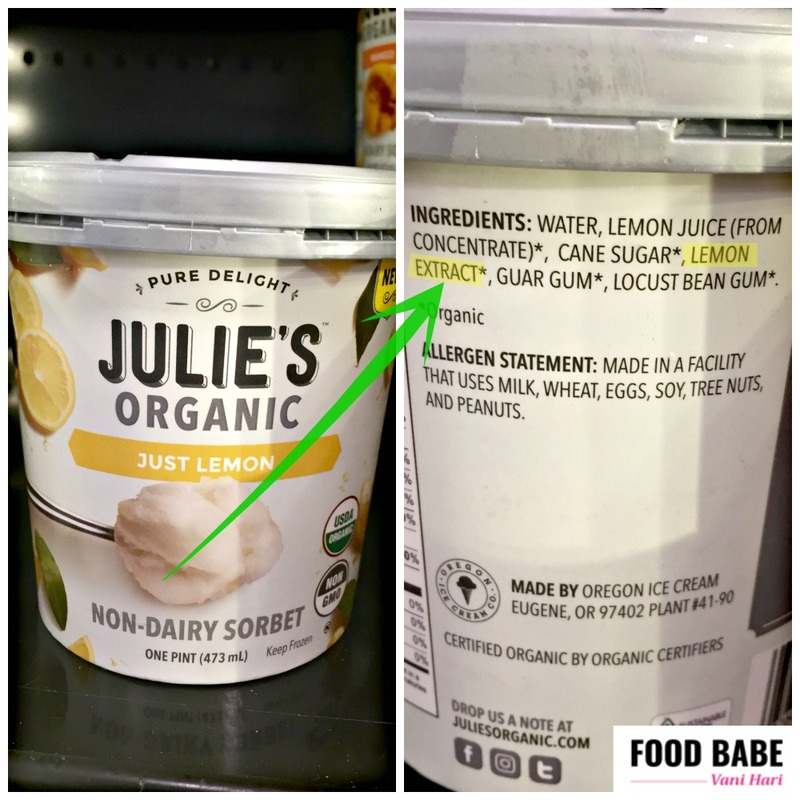 In products that don’t carry the USDA Certified Organic label, but are made with some organic ingredients, they still need to use organic “compliant” flavors. This means the flavors in any product labeled as “Made with Organic” ingredients can only contain flavors that are compliant with organic regulations as far as no GMOs, sewage sludge, or ionizing radiation used, and also cannot contain synthetics or artificial preservatives. However, the flavors themselves do not need to be certified organic. An essence captures the hint of flavor from a fruit or vegetable. To make a strawberry essence for instance, they may start with a strawberry juice concentrate and heat it to collect the steam and that becomes the essence. It should contain no additives or other ingredients. An extract is as pure of a flavor you will get and the closest thing to real food. It’s similar to how you could make homemade vanilla extract by putting vanilla beans in an alcohol solution to extract out the flavor. Due to how extracts are produced, they can have some nutrients in them too. Organic Lemon Extract is derived solely from organic lemons and is in compliance with organic regulations (no GMOs, no synthetic preservatives, etc). I hope this helps you sort out all the added flavors, essences, and extracts in our food. Please share this post with all your friends and family, everyone deserves to know what’s behind these added flavors. This Broccoli Salad Will Make You Want To Eat All Your Veggies! Posts may contain affiliate, sponsorship and/or partnership links for products Food Babe has approved and researched herself. If you purchase a product through an affiliate, sponsorship or partnership link, your cost will be the same (or at a discount if a special code is offered) and Food Babe will benefit from the purchase. Your support is crucial because it helps fund this blog and helps us continue to spread the word. Thank you.